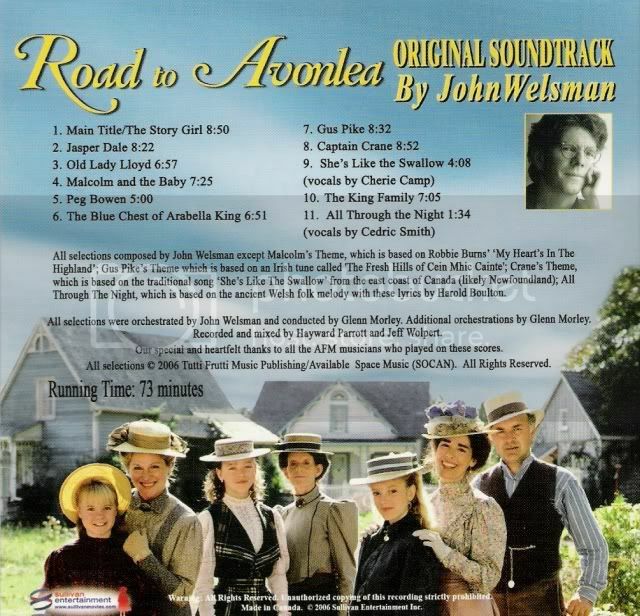 There is only one Road to Avonlea soundtrack that you can buy. Right now, the sixth season comes with a soundtrack that has music by John Welsman. According to Sullivan Entertainment, this soundtrack will never be able to be purchased. It's just an agreement between them and John Welsman as a special for the devoted fans. Unfortunately a complete soundtrack has not been released and I highly doubt that one will ever be released. Between the Welsman soundtrack and the Gillis soundtrack a great deal of the music has been released, but unfortunately music done by the other composers is "lost". The Don Gillis soundtrack has fourty-one tracks and the running time is fifty-four minutes and twenty seconds. Click on the desired picture for a larger size. This soundtrack only has music written by Don Gillis, thus the music from the earlier seasons is not on the soundtrack. It does not have Gus's theme. Unfortunately parts of the cd are a bit redundant and not all of the music screams "It was heard in ____ episode!!" An queer thing about the cd is that the tracks are very oddly named. Most of the titles aren't played when the title suggests. There are a few though that are correct such as "The Steeple Chase" and "Rodeo". 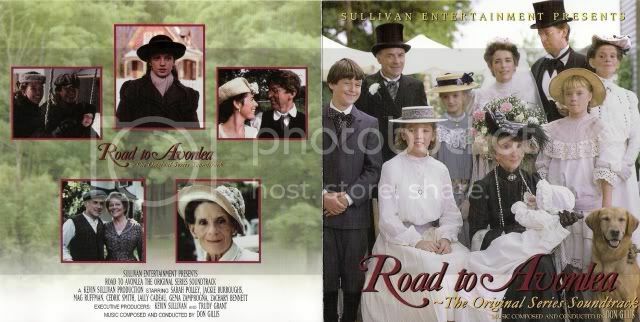 Most of Gillis's Road to Avonlea music isn't what most fans would consider to be the memoriable music from the series. Sadly, listening to the Gillis cd doesn't bring Avonlea to mind. I think that this might be partly be caused by the fact that Gillis's more familiar or perhaps memorable Avonlea music wasn't included on the cd. I realize that I'm being fairly harsh with this cd. 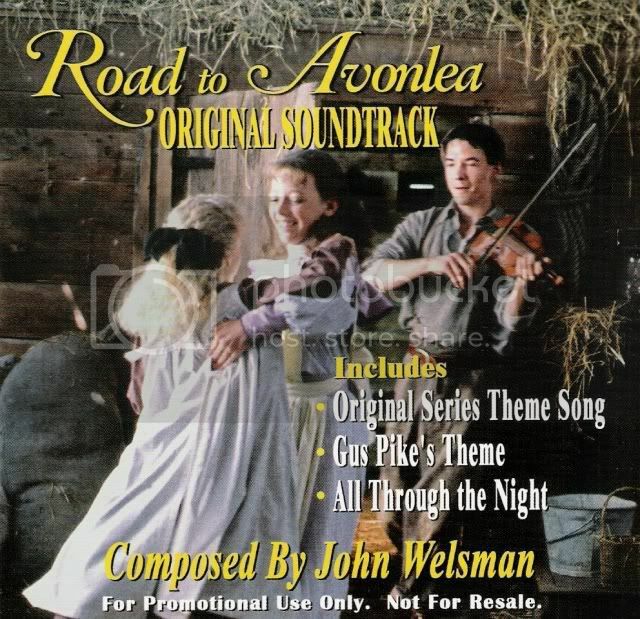 I used to really, really like this cd but after the release of the Welsman cd and after I purchased and listened to the extra 'Anne' soundtracks this cd is not high on my listen-to list. A lot of the music on this cd is heard in season four with possibly most of the season four music coming from "Moving On/Sara and the Marshall" and "Felicity's Perfect Beau." Some other music that I can pinpoint music coming from would be "After the Honeymoon", "The Race", "What a Tangled Web We Weave", "The Ties that Bind", and "Return to Me." I'm somewhat surprised that the opening music from "Love May Be Blind..." isn't on the cd, but perhaps because I thought that the opening music from that episode was really pretty. This sound track has eleven tracks and the running time is one hour and thirteen minutes long. This soundtrack is very enjoyable to listen to. The cd is very enjoyable to listen to. The only complaint I would have is that the tracks might be a bit too long- which is somewhat humorous since the tracks on the other cd are too short. Each track is very complete and thorough with covering its title. I don't think there's really any need for me to go through and pinpoint each episode the music can be heard in. I think it's very selfexplanatory. Some of the themes that were written specifically for a character were sometimes later used in the series for a different character. Some of the music heard in "Old Lady Lloyd" track was later used in "Old Friends, Old Wounds" as well as used as 'Rachel's Theme' in season six. The sad rendition of "Malcolm and the Baby" is later used in "Thursday's Child". This would be my brake down of the soundtracks. I'm not going to guarantee that it's 100% accurate. 2:10 to 3:00 a little bit of Peg Bowen in there. 3:01 to 3:34 canvasing for money in "Story Girl"
1:13 to 2:40 from "Blue Hope Chest"
2:41 to 4:07 "Dreamer of Dreams" when Olivia is at Jasper's house talking to the window. 5:24 to 7:15 It's from Story Girl, but not certain where. Could also be from Dream of Dreams too. 7:15 to 8:23 end credits to "Blue Chest"
I think all of this is from Old Lady Lloyd. This music only appeared in a few episode... It was played in all of the Rachel themed episodes of season six, the most in "Home is Where the Heart is". Some of the Peg music is also heard in "Witch of Avonlea". I think actually to 4:10 ro 5:35 is heard in "Witch of Avonlea" and possibly not even heard in "Song of the Night/Old Lady Lloyd". The Red Rose music though is what's rarely used. 0:00 to 1:52 chasing Malcolm across the field in "Abigail's Beau"
6:27 to 7:25 end credits to Malcolm and the Baby possibly Agigail's Beau too. I think that all of this music was only played in this episode. 0:00 to 1:02 end credits Aunt Hetty's Ordeal - also used in the season two tv clip. 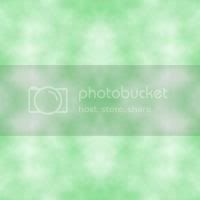 2:44 to 7:04 Sea Ghost - I think it's all from Sea Ghost, but a bit may be from All that Glitters. 7:05 to 8:32 end to Sea Ghost, I think. 1:38 to 8:52 I can't quite separate the two. The majority of it is from Sea Ghost, but some is also from All that Glitters. This was recorded just for the cd. John Welsman's wife sings it. She also sang "Amazing Grace" in "Song of the Night". 0:00 to 1:09 erg... it's the opening of the episode that starts with the kids running out of school... I think that's Witch of Avonlea or is it Nothing Can Endure but Change? 1:10 to 7:05 I'm not certain... I think most of the music is heard in Nothing Can Endure but Change. I'm not 100% certain on that, but I *think* that's where it's all from. This is from "Thursday's Child". The possibilities of this soundtrack ever being released to be available for purchase are exceedingly slim. This will only ever be available as an "goody". 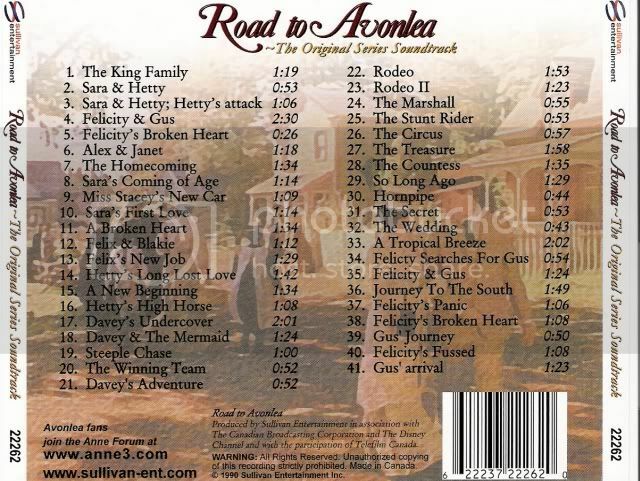 Right now, if you order season six from Sullivan Boutique you will receive the soundtrack (and a few other extras such as six pictures of the cast). I highly recommend getting this cd. This cd definitely brings Avonlea to mind. You can buy copies of the soundtrack at Sullivan Boutique.